When did you first meet Mick and Jackie? We worked together for another UK based travel company at the time we first met back in 2004 and I did tours with both of them in Italy during that time. Once they had started their own business, and it was growing successfully, they needed an extra pair of hands and approached me to work with them in the autumn of 2011. Explain a bit about your role within Hedonistic Hiking? 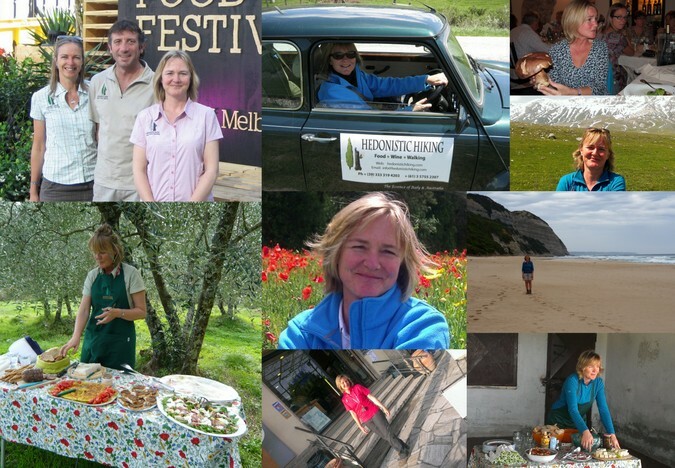 It's actually quite a varied job - I work alongside Jackie in the season as Tour Manager on some of the Italian tours but, all year round, I work on the PR and Communications side, for example developing the website, writing blogs and monthly newsletters, producing the annual brochure and calendar, maintaining mailing lists and general admin! I work from home in Leicestershire in the UK but since the work is entirely web-based I could really live anywhere. We Skype often and are always in touch so we usually all know what is going on! What sparked your interest in Italy? When I was young my family came to Tuscany every year on holiday and we used to spend a month by the sea in Castiglione della Pescaia. My father was involved in the shoe industry and had many suppliers and colleagues in Italy at the time. I think somehow the country (and its food!) got under my skin without me knowing and it wasn't until much later that I realised how much I wanted to come back. I had worked in London for about 12 years when I had my "epiphany" moment - left my job, rented out my flat and headed for 3 months in Siena learning the language and travelling around the country. I never went back to London life! As I had done a French degree at university I think maybe I found it a bit easier to learn a second language, and was soon looking for ways to work in Italy. So is Tuscany your favourite Italian region for food and wine? Impossible to choose! It's hard to eat badly in Italy, even though all the regions have such different cuisines, but often the most delicious places to eat are easy to miss, as they are not necessarily the glossy restaurants in the most touristic spots. Head down the medieval alleyways, drive up mountain tracks, or step inside an unprepossessing doorway and you will usually be richly rewarded. And if the chef happens to be the family's grandmother then you have more often than not struck gold!! I've been lucky enough to visit Jackie and Mick the last three years during my winter which has been a fantastic experience. We've travelled to Sydney, Canberra, Adelaide and Melbourne and spent time in the beautiful High Country of course. I love the incredibly relaxed way of life and find the people very welcoming and non-judgemental. I also think the Aussies have a very "can do" attitude - they are resilient and resourceful. In my experience a few beers or a fabulous wine from a boutique winery, a big view and a great sunset are usually the order of the day - what's not to like? On my last visit I had the chance to hike the full 100 km of the Great Ocean Walk which, if you have never done it, is a spectacular trail full of interest, wildlife and seriously stunning landscapes. I would recommend it to everyone - even if you live in Victoria and think you know the Great Ocean Road - it is a totally different experience to complete it on foot. I will be working on both the Abruzzo tours this year in Italy and we are looking at new developments for the website. As technology changes and people spend more time on phones and tablets, websites are having to change too to keep pace. So there is lots to do to maintain and promote our internet profile and we are starting to make plans for more Information Evenings in new cities Down Under for next year. And I'm hopeful that there will be time for a few good walks and the odd glass of wine too!